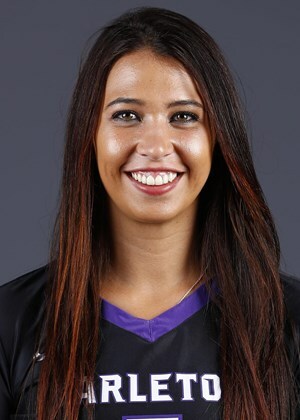 Blanca Izquierdo, a senior setter for the TexAnn volleyball team, took home her first LSC Setter of the Week Award. Izquierdo was awarded the honor after she served a combined 35 assists against Texas A&M-Kingsville and St. Mary’s. Blanca Izquierdo is a senior setter for the TexAnn volleyball team and took home her first LSC Setter of the Week Award. Although she may have won an individual award Izquierdo says she could not have earned this honor without her teammates. “It was shocking, and I was really happy about it. Because I think especially when they give a weekly award to the setter, it means that the team is doing a good job. It is not possible for me to get that recognition if my passers are not giving me good balls, and my hitters are not putting the ball away. So, to me it was more like a collective recognition,” said Izquierdo. Izquierdo credited her play this year to improvements she made in the off season but credits her strong mentality for her success this season. “I got a lot tougher mentally. Definitely you get stronger mentally. My position has a lot of pressure already because the setter has the whole responsibility of the attack of the team. You’re responsible for the offense so you have a lot of pressure; plus I’m a senior so I want to do great so I have a lot of pressure, and coaches are expecting a lot from me since I’m a senior, and I’m a setter so all of that adds to it and you have to get stronger mentally,” said Izquierdo. When asked what her goals were this season Izquierdo says that she doesn’t want to limit herself but wants to finish her senior year with no regrets. “I don’t believe in goals because I think that whenever you set a goal you are limiting yourself. You may be able to accomplish something way bigger than you thought. So, my goal is to achieve the maximum possible with no limits and leave the court with no regrets. I want my last game of college volleyball [to] finish that game and I gave everything I have. I enjoyed these four years and I gave it all and no regrets,” said Izquierdo. Izquierdo a native of Madrid, Spain, was welcomed to the TexAnn roster in the 2017 season and has since become a staple of the TexAnn offense. She has recorded a team leading 363 assists during her two-year career playing for the TexAnns. On top of leading her team in assists Izquierdo has recorded 21 services aces and 118 digs. Coach Schindler went on to say that on top of Izquierdo’s excellent play, her larger than life personality is just as valuable to the team. “Blanca is a little fireball. She plays with a lot of passion and it’s also so fun to have someone who brings her uniqueness to the program. She’s an international student, obviously, and you know her personality and what she brings is unique and genuine and I know the girls really enjoy having her,” said Schindler. “Her setting is great, as well as her personality on the court. She’s a good leader and she’s really like a spark for us. She tells us what we need to do and what we need to run and she’s the first person to get excited and really get everyone into the game,” said fellow teammate Hannah McManus. Izquierdo and the TexAnns will look to add to their 15-game winning streak this weekend on the road. They take on the University of Texas A&M-Commerce on Friday at 7PM at Commerce, and Texas Women’s on Saturday at 2PM in Denton. Blanca Izquierdo is a staff member at Texan News Service.